If your property hosts a waterway, there are many good reasons to plant natives along its banks. Riparian planting, alongside waterways, makes a positive contribution to environmental health. Effective planting improves water quality, reduces soil erosion and builds the biodiversity of the stream. If you’re considering planting a riparian strip, there are a few sensible steps you can take. Check your eligibility for financial assistance. 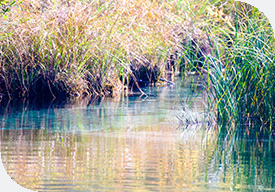 Many regional councils and environmental organisations make financial contributions to riparian planting, so check with your area’s environmental officer and look online. Consider putting the riparian area into a protected lot and check the requirements. Some councils have incentives, which include allocating a subdivisional title. Depending on the existing land use, fencing is important to keep stock off new planting. Prior to planting, make sure you have good pest control. Plantings in regions infested with the likes of blackberry or Japanese honeysuckle are doomed, unless you plan post-planting maintenance. Deer, rabbits and pukeko also need to be dealt with. Obtain a good supply of plants. Cheap is not always best. Smaller plants have a higher mortality rate and will take longer to be self-sustaining. Budget for ongoing maintenance for three years to keep down weeds. Target weeds that are competing for light and nutrients, and spray carefully and selectively.